The clouds cleared as I peered outside the plane window, revealing patches of green. Golden stupas stand tall, scattered intermittently in the green mesh. I have travelled to Myanmar in a lush green morning of the year 1104. “Welcome to the land of Golden pagoda”, the foreigner beside me whispers. She is visibly excited. So am I.
I am flying over a country I never thought I would visit. A country I knew very little about and a country that isn’t on many bucket lists. The air hostess winks as she bids good bye. Intense reading about the country tells me that messy, crumpled US dollars are worthless in the country and smiles are priceless. And as I fervently try to exchange a folded note at the exchange counter and when I meet Mr. Minn, our guide at Mandalay, and see his tiny eyes disappearing in a wide toothed grin, I know exactly why it was said so. Myanmar grows onto you. It doesn’t wow you or spellbind you at the first instant, but weaves its magic slowly but surely. “Throw a stone and find a pagoda” I thought it was a hyperbole by Mr.Minn till I actually lost count of the pagodas that whizzed by as we drove past them. From glistening golden to earthy brown to withered white, the pagodas came in all sizes. When you actually give up counting, you will start noticing the architectural brilliance of these structures, built meticulously with faith and more. 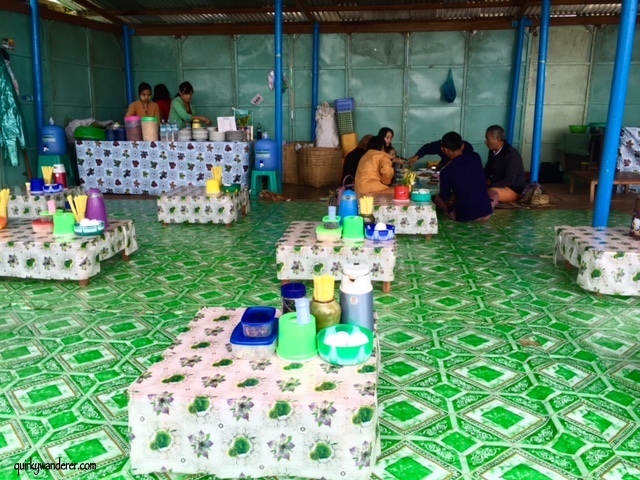 Small, cozy tea houses and locals huddled together over cups of piping hot Laiphet yeh ( black tea with condensed milk) is a common sight in Myanmar. Walk through the by lanes of a Burmese suburb and find yourself amidst a bustling tea- house. Marvel at the swiftness of the lady making tea in tiny cups with condensed milk, dishing out cup after cup. Tea houses are where conversations are struck, politics is discussed and hours are spent mulling over little somethings with endless cups of Burmese tea. Hop in for a conversation, a tiny white cup filled till the brim , served with pancakes and love of course. Complete strangers will get out of their way and help you. Local ladies at Bagan insisted they deck me up in their local attire ( lyongyi). Their excitement in dolling me up was infectious! Mingalaba and a smile is all it takes to instantly make a Burmese smile. The kids love to be photographed. Point a camera and they will startle you with their poses and poise. Retire to your hotel room after a long day and find cute messages and bunches of flowers left behind by the local staff. The people of Myanmar will melt your hearts with their simplicity and hospitality. From local markets outside pagodas or the maze called Scott’s in Yangon, the markets in Myanmar are a shopper’s delight. 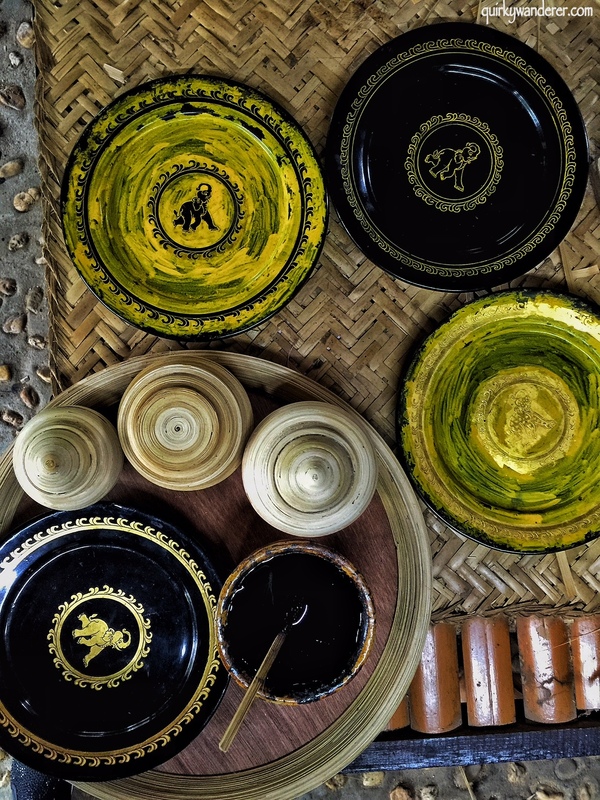 The Burmese arts and crafts are authentic and truly innovative. Colourful Burmese umbrellas, hand woven shawls, vibrant puppets and dolls, intricate lacquerware, precious and semi precious jewellery, souvenirs, lyongyis :the list is endless. While I flunked the bargaining tests big time, I don’t regret any shopping experience of Myanmar. 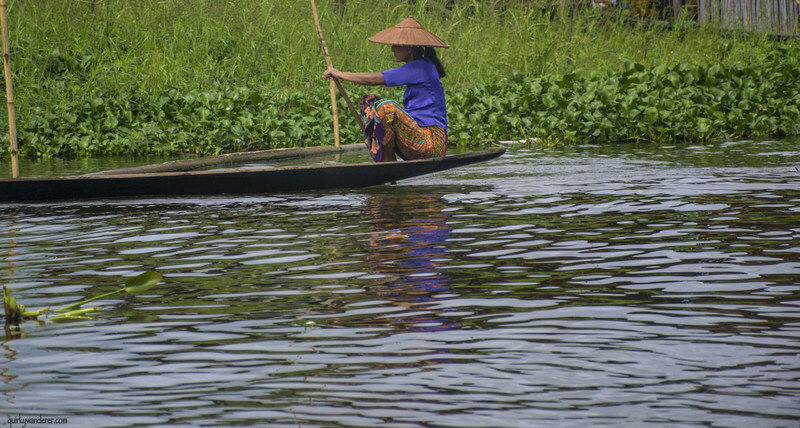 Small factories and workshops nestled on water in Inle Lake have their own quintessential old world charm. Don’t like shopping? Fret not. The markets will provide ample frames for your camera. While the first impressions of Myanmar are that it is unpretentious, raw and undeveloped, certain rural landscapes are too dainty to be missed. Drive from Heho to Pindaya and you won’t rest your camera or your eyes even for a tad bit. Carpets of yellow mingling with swaying wheat and lush greenery, kissing the clouds in a bright blue sky. For a moment it looked Tuscany without the vineyards. Of all the things I had read about Myanmar, this was a surprise package. Houses dotted this rural landscape making it picture postcard worthy. The landscapes of Bagan are ethereal too. With thousands of pagodas and absolutely no concrete disturbances, Bagan takes you back in time. Floating vegetation, one legged rowers, quaint wooden houses and all of this engulfed within mountains of the Shan state. Narrow speed boats will ferry you around as you witness how an entire city dwells in the lake. If I had to go back to Myanmar and visit just one place again, I’d choose Inle any day. It is massive, it is untouched and it gives you a glimpse of their local life like no other place. 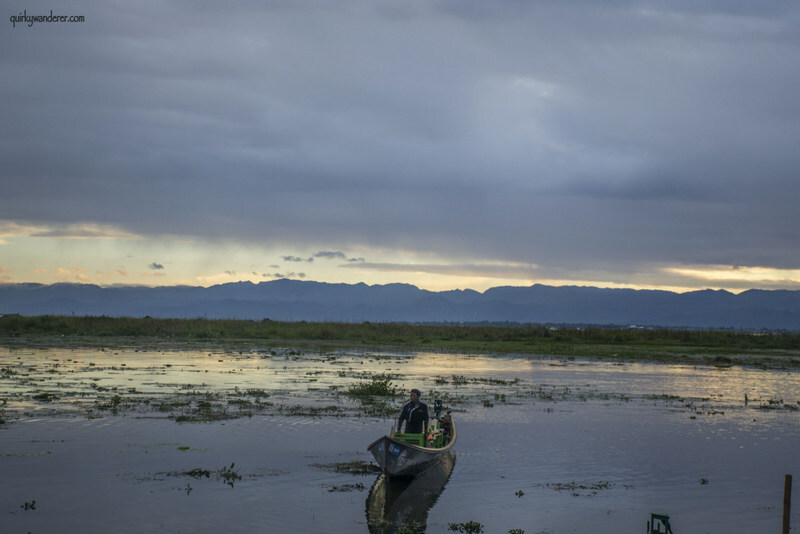 High on local arts and crafts and with an array of cultural dances, Inle is quaint, serene and and truly mystical. Armed with my list of survival words: Tathaloo ( lifeless) , Atha ma sa bu ( I don’t eat meat), ta tha loo shi la ( do you have vegetarian food? ), I try to survive in a predominantly fish loving country. I come back enlightened. 1. The food is fresh. Salads will never disappoint. 2. It’s either rice or noodles. Say goodbye to anything remotely similar to chapatis. 3. If everything fails, fresh fruits will always come to your rescue. 4. Local street food has plenty of options. Being experimental helps. Confused about traveling to Myanmar? Here is a list of Myanmar travel tips for your reference. The right time to visit Myanmar is now. Modernisation hasn’t crept in and most places have a quintessential old world charm. Yangon and Mandalay are slowly developing and you will find concrete labyrinths here( barring the colonial parts of Yangon and Amarapura in Mandalay ) but Bagan and Inle make you time travel. Devoid of fast food culture and MNCs, local life is rich and unadulterated and markets still have a distinct flavour. If you want to experience the country in its truest form, this is the best time to go. Yangon reminds me of Mumbai but it has its own charm. Here is a list of tips I read before visiting Yangon. I see blinkering lights below as the flight kicks off from Yangon. Dotted lines glimmer in the dark as I rest my head and recollect how the land of the golden pagoda had a calming effect. Is it because of seeing innumerable smiling Buddhas over the past few days or maybe I am just sleepy. Myanmar humbles you. Not because of its modest background. But because of its humility despite its opulence. There is gold everywhere. In glimmering pagodas, gleaming Buddhas and gold flakes. But the gold in people’s hearts glitters too and that is what is abundantly magnetic. I haven’t mastered the art of tying a lyongyi or bargaining with a shop keeper, (big deal!) I have mastered mingalaba and jesuba ( thank you) and they have sailed me through. Through taxi rides, river cruises, pagoda visits, photo sessions, city explorations and local interactions. For all this and more, I look back at the last visible bit of Myanmar and mutter “Jesubeh” as I plunge into sleep and travel back to 2016. Here’s a travel video shot at Myanmar, giving you a glimpse into the country and its culture. I just fell in love with Myanmar because of your post, Divyakshi. Also, I tried long and hard to try and think what to type and gave up. Out of this world! Just fell in love with Myanmar, thanks to this post. Wonderful piece of writing. I am contemplating Myanmar in 2017. Your blog just had a catalytic effect on my penchant for the land so near yet so far hidden from the mass tourism. When(month) did you visit? Thank you Amitava 🙂 visited it in November this year. 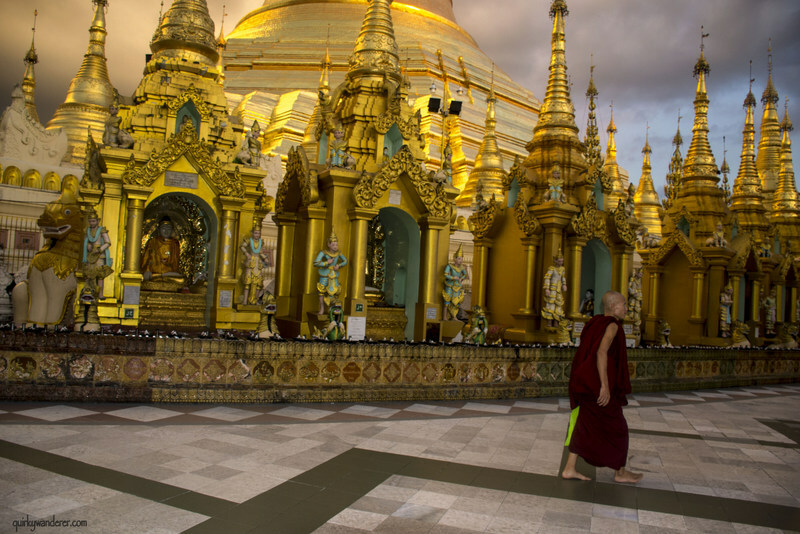 More on Myanmar to follow.hope the series helps you plan your trip. Absolutely wonderful writing and images. Would you mind if I reblog this? Thank you for sharing! Thank you 🙂 glad you liked it! Feel free to! Yes in parts definitely:) Bagan , Inle , interactions with locals top the list:) thanks for reading and being the perfect critic! Such lively portraits and colorful scenic captures Divsi 🙂 The sky, smiles around, and captures. Definitely reason to include it in bucket list. Cheers. Thank you Anita 🙂 glad you liked it! Wow. After a long time, I have seen a blog which I will read again and again. The pictures are so lively that it makes me want to pack my bags now and head to Myanmar. I long to see this place. Your blog also points out some gems I did not know about such as Pindaya caves. It’s my dream to see Bagan temples. 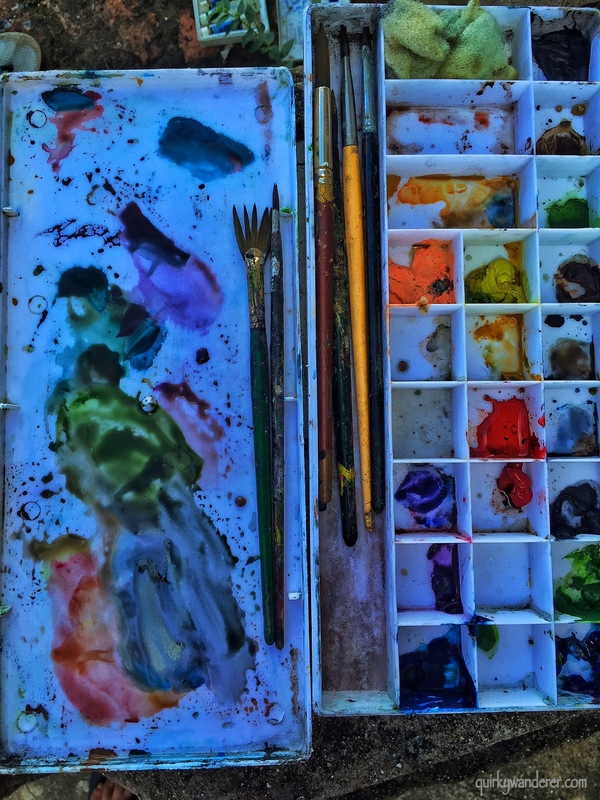 Kudos for this wonderful blog! Welcome! My target in next 2 years! What a happy and vibrant country. Loved your clicks Divyakshi. I’d flunk the bargaining exam too 😛 Love how well your photographs tell the stories, Divyakshi! Thank you heaps Alexandra! 🙂 So happy you liked them! WOW, Divyakshi, WOW. I was with you and could never capture and describe Myanmar as you have! Thank you so much Roshan 🙂 Your encouragement is as valuable as your company <3 so happy you liked the pics! You did take me to year 1104! Wonderful read of your experiences in Myanmar. Okay, I knew I wanted to go there. Now your post and of course the beautiful pictures have ignited the urge even more. I thought for long as what would be that one thing I would like to see there first. I still can’t figure out. Everything about Myanmar is so enticing! Please tag me whenever you write future posts, I don’t want to miss anything. Oh em gee.. Loved all the pictures. The colors, the smiles, the natural beauty all around. You created such a beautiful world with your work there, Divyakshi. A lovely post with some wonderful pics! Divsi, I am absolutely speechless! This post was simply brilliant! You actually have brought out the soul of Myanmar through your wonderful images and beautiful words. I haven’t seen anything more picturesque! Tea with condensed milk? Hmm have to try that! 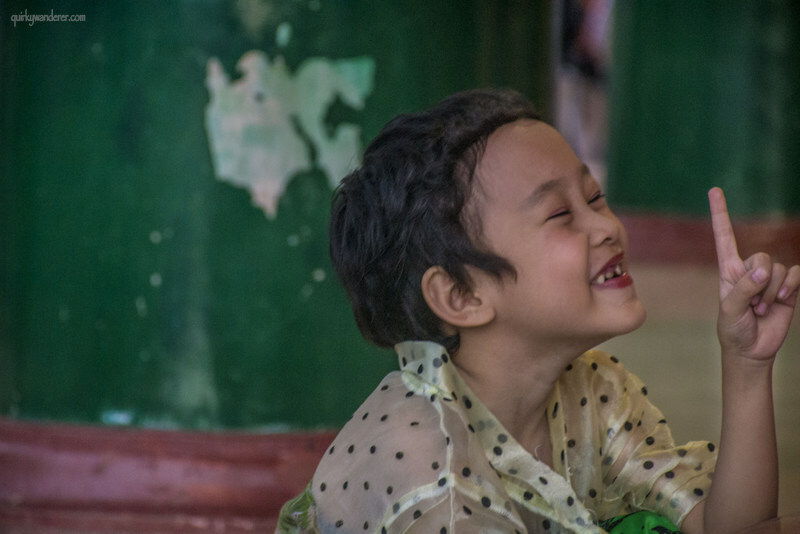 Thhat tea house, the shopping trails, the pagodas, the cheerful smiles, the vivid skies, the culture, the food…and yes the rainbow over the fields….love, love them all! Thx for that great article. Myanmar is already on my list. Andcu really live your pictures! Myanmar looks stunning. Your photographs really bring the place to life, they’re so colourful. How did you find travelling in the country? Were they welcoming to travellers? The people seem so lovely and open-minded. Must be super interesting to talk to them and listen to their stories. Especially those about nature and their heritage. I was considering visiting Myanmar last year but gave up in the end as it didn’t fit into our schedule. Now you make me want to visit there this year. That Shwedagon Pagoda looks gorgeous! It is nice that you got to meet the people from the tribe. Love the smiles on their face! I love it already. Such a colorful country and so friendly people! Myanmar has been on my bucket list for a while as well. Seeing these images makes me want to visit even more than before! 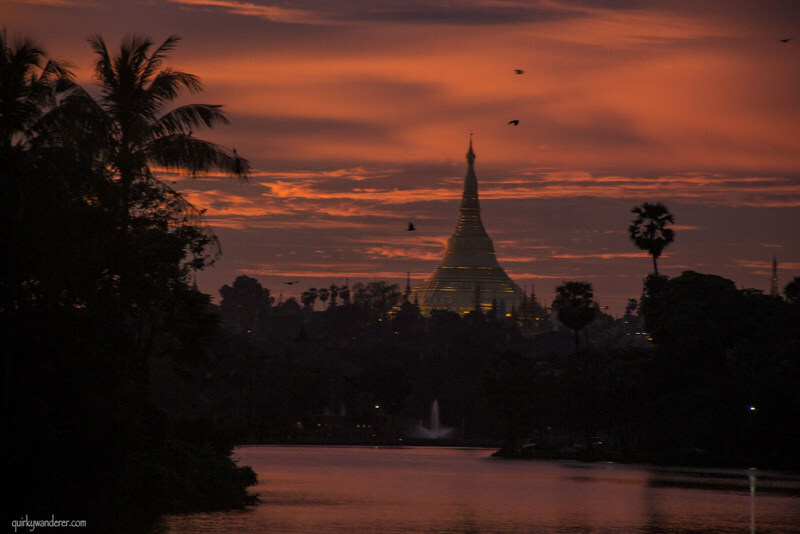 What beautiful photography – and what lovely people in Myanmar. I would love to visit – and I’d even put up with the endless pagodas! Myanmar looks absolutely amazing! I’m luckily heading there in a couple of months so I found this post at the perfect time! I’m so excited to try that awesome-sounding tea – I’m a tea-lover for sure. The Pindaya Caves are mesmerizing as well. I love your video as well! So great! Everything about Mynamar screams ethereal, old world charm, from the pagodas and temples, to the tea houses, fields, and tribes. I love your people photography – what an amazing experience to have been able to visit these tribes in person. And as for the buildings – you’re right – so much gold! 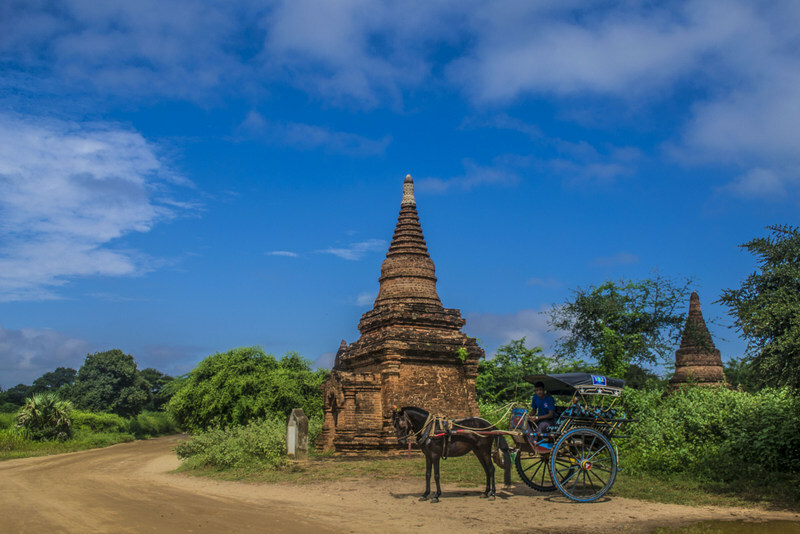 I’m in two minds about Myanmar – obviously it’s got so much in the way of authentic cultural experiences, and it does sound like an incredible country for a traveler to witness – it saddens me to hear on the news though about the Rohingya Refugee Crisis. I would love to travel and volunteer as aid, and then perhaps take in some of the sights of the country as you have. Myanmar is one of my favorite countries! And I actually wrote about it, too! You’re right, you’ll lose count on the pagodas in Bagan. I did not even try. Hahaha. Did you go to the falls in Pyin Oo Lwin? They are amazing and you can reach those falls by just bicycle. Burmese people are so nice that even if they can not communicate in English, their non-verbals are just the best way to feel their warmth and sweetness. I remember, I was roaming around Pyin Oo Lwin with Thanaka on my face. Hahaha. Everyone should try that Burmese moisturizer! “Throw a stone and find a pagoda” love it! That architecture is very different. This is the type of place I need to start planning for. I’ve seen so much of Europe that this type of history and culture is what I think I need to start including in my travels. The magic is in the smiles of all the people. Just from your pictures of people smiling make me want to visit. Speaking of your pictures they are so vibrant and beautiful. Love this post. Thank you for your sharing! I have to say that Burma through your eyes and lens is really vibrant and eye – catching. 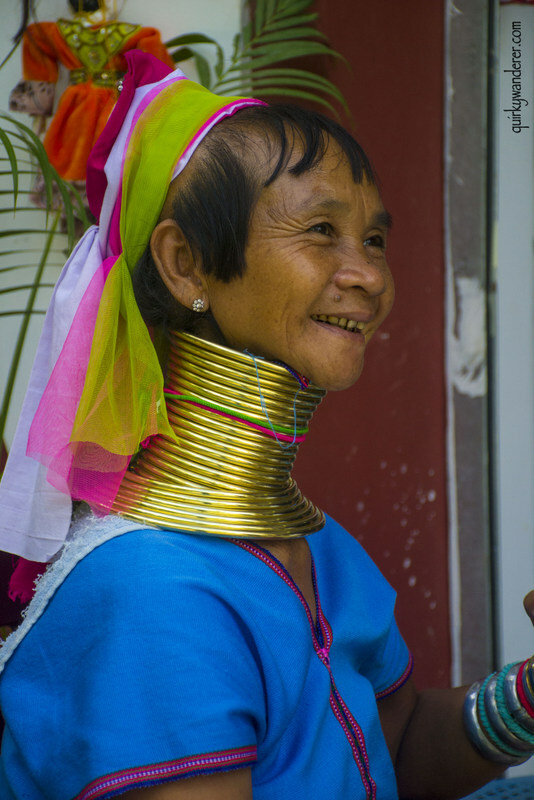 An image of the woman in Long necked tribe inspires me to research into some tribes in Southeast Asia. Myanmar is slowly opening up for tourists. Such a beautiful country with lots of culture and history. Many reasons to visit Myanmar. amazing post attractive pictures really nice…. one day i really go to visit there thanks for sharing a beautiful post….! Hi Divsi, The pictures are out of the world and the narrative is interesting. I was always under the impression that getting vegetarian food would be difficult in Myanmar. This post changed my perception.